(R1) Given the results of the survey, there will be an ongoing need for awareness raising activity in the foreseeable future. (R7) The UK Government and funding bodies should promote further development of collaborative standards and methodologies in digital preservation for all parts of the digital preservation lifecycle. In particular, a roadmap of how to scale up a system while meeting standards is needed. (R4) Organisations should include long-term data retention as a criterion in the cost-benefit analysis of any project that will lead to the creation of a substantial amount of digital information. (R 9) The UK Government and funding bodies should promote, through seed funding, the creation of more digital archives across relevant sectors and organisations. Promote collaborative regional or national repositories to meet the needs of small and medium size organisations. These can then be promoted as exemplars for other organisations to follow. (R2) Organisations should create a long-term proactive information/knowledge management plan. This should start with an information audit and then, once the problem has been appropriately sized, the task of creating a solution should be properly resourced. This should include the assignment of clear responsibilities. The full list of recommendations from the 'Mind the Gap' report may be found in the Recommendations Table PDF 245KB. The value and success of the 2006 'Mind the Gap' report, both to its membership and the wider community, are recognised. The DPC are now commissioning a study to review and analyse the report's final recommendations and to produce a transparent action plan for the DPC, its members and the wider digital preservation community. Both DPC members and a number of consultants have been invited to tender for this proposal. It is hoped that the work will be completed by the end of September 2008. The UK Needs Assessment, undertaken by the DPC, aimed to gather and collate a picture of the status quo in the UK with regard to digital preservation; to assess and develop a clear way forward; and, last but not least, to communicate that message to a wide and diverse audience, including those who may not have considered that digital preservation was part of their remit. 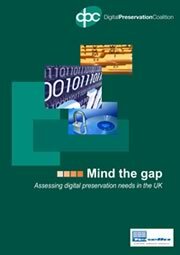 This needs assessment culminated three years later in a report, Mind the Gap: assessing digital preservation needs in the UK. The report was launched at the Houses of Parliament on 15 February 2006 by Andrew Stott, Deputy Chief Information Officer & Head of Service Transformation, E-Government Unit. Organisations should continue to raise awareness of the impact of digital preservation beyond the current core of informed individuals and institutions. Organisations should create long-term proactive information/knowledge management plans and assign responsibility for dealing with digital preservation issues. Regular audits should also be performed to assess and address digital preservation needs. Training in digital preservation should be encouraged and programmes should be integrated into the training of professionals such as conservators, librarians and archivists. Awareness of digital preservation issues should be raised at government level, both nationally and internationally, in order to influence relevant policy making. An international collaborative 'market' for digital preservation tools should be created. Such a market should encourage the use of open file formats and standards and consider the long-term preservation needs of digital information.